Wireless Signal Forwarding: Backup Enables wireless alarm signal communication to the central station as a backup to a phone line. Forwards alarm signals to the central station only if the phone line fails. Signal Forwarding: Primary or Redundant Enables wireless alarm signal communication to the central station as the primary or redundant signal path. No phone line or Internet connection is needed. Remote Arming/Disarming Arm/disarm system remotely via web or mobile apps. System Status and Summary of Recent Activity View an at-a-glance summary showing the current system status and any recent activity at the property via web or mobile apps. User Code Management Add/delete/edit user codes remotely, and track which users arm/disarm the system at what times. For systems with multiple partitions, choose which partition(s) each user code can access. Searchable 60-Day Event History Search a 60-day history of events reported by the system, including alarms and other activity, via web or mobile apps. Customize the time frame of the search, and filter by device or event type. Download results as HTML or Excel files. Multiple Permission-Based Web Logins Create different sub-users for the account and grant varying levels of permissions for each user to view/change various settings in the Alarm.com online account. 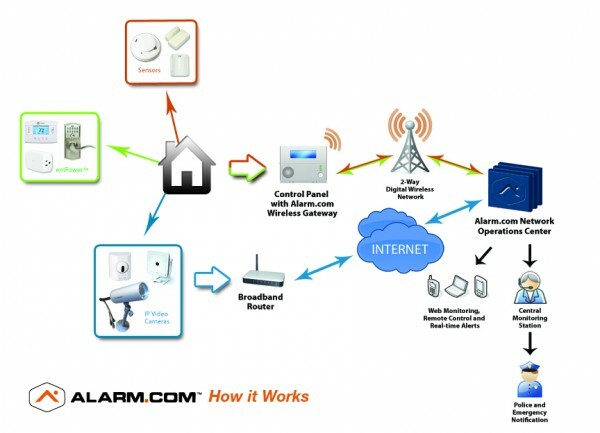 Multi-System Access Access multiple security systems from a single account through a convenient drop-down menu in the Alarm.com online account and mobile apps. 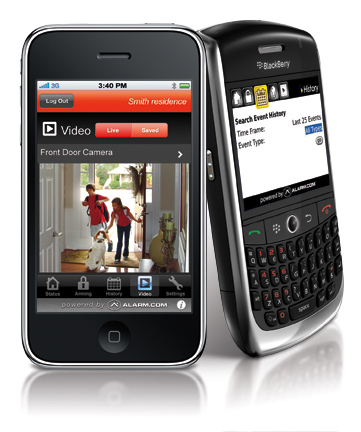 Arming/Disarming Receive email/text message notifications when the security system is armed or disarmed. For arming/disarming at the panel, the event notification includes the person’s name whose user code was entered via the panel keypad. For arming/disarming with a keychain remote, the notification indicates which remote was used, such as Bill’s Keychain Remote. System Events Receive email/text message notifications for power failures, sensor tampers and malfunctions, panel low battery, and other types of system events. No-Show Alerts Receive email/text message notifications if a certain person did not disarm the security system during selected times on chosen days. Sensor-Left-Open Receive email/text message notifications if a particular door, cabinet, or window sensor is left open for an extended period during specified time frames. For example, receive an alert if the garage door is left open for more than two hours between 11am-11pm, Sat.-Sun. Also, receive a Restoral Notification once the sensor is closed again. Severe Weather Alerts Available within the United States, receive alerts from the National Weather Service directly on the security control panel screen if there is an approaching tornado, tsunami or fire. Weather to the Panel Get current weather and up to 6-day weather forecasts displayed on the security control panel screen and keypads. Voice Notifications for Alarms Get automated phone notifications for alarm events. Voice Notifications for Non-Alarms Get automated phone notifications for non-alarm sensor activity, including door openings, motion detection, etc. Weekly/Daily Email Reports (Arming/Disarming) Receive a weekly or daily report summarizing all security system arming/disarming that occurred during a selected time frame. Weekly/Daily Email Reports (Normal Activity) Receive a weekly or daily report of 24/7 non-alarm sensor activity such as door opening/closings or motion sensor activations reported by the security system. Arming Supervision Receive email/text message notifications if the security system is not armed or disarmed by a particular time each day. Auto Re-Arming Schedules Create automated schedules so that if the security system has not been armed during the time between the start and the end of the schedule, it will automatically re-arm after a specified period of inactivity. Automated Arming Schedules Create automated schedules so that the security system arms/disarms itself at certain times each day. Enterprise Security Console Designed for commercial end users with more than one Alarm.com-enabled security system, log into a single online account to view system status and recent activity on all systems. emPower Lights Send commands to turn lights on/off via web or mobile apps. Create automated light schedules to have specific lights turn on at certain times, for specified lengths of time. Create rules so a specific light turns on if a certain sensor is activated. For example, turn on hallway light if front door is opened. Also, create even-triggered light rules based on arming/disarming and system activity and also set up custom automation rules. emPower Thermostats Remotely control thermostat(s) via web or mobile apps and easily create custom schedules to set temperatures based on time of day, day of week and the status of the security system to make properties run more efficiently. Receive real-time email/text message notifications when a thermostat setting is changed or the temperature goes out of range. Also, an inclusive Extreme Temps feature allows automatic target temperature adjustment when it’s extremely hot or cold outside. emPower Locks Remotely control door locks via web or mobile apps, see lock status (locked/unlocked) and receive email/text message notifications when a lock is accessed by a specific user. For example, front door lock was unlocked by Handyman Hank at 11:32am on Fri., 1/20/12. Also, set up automated locking/unlocking based on security system arming/disarming. Customizable Video Clip Recording and Alerts Create video recording settings based on security system events, video motion detection and time of day. Receive email/text message notifications, including optional video clip attachments for instant playback via web and mobile apps, whenever new video is recorded. Video Clip Playback Watch recorded video clips on the Alarm.com online account, as email/text message notification attachments, or via Alarm.com’s mobile apps. Remote Video Storage Video is stored via Alarm.com’s secure, hosted off-site server, no local PC or video server required. However, users can view and download stored video clips to a local computer. A video clip can also be protected from being overwritten by newer clips once the remote video storage limit has been reached. Stand-alone Video View live video on up to 8 cameras simultaneously and watch recorded video clips on the Alarm.com online account, as email/text message notification attachments, or via Alarm.com’s mobile apps. Create video recording settings based on video motion detection and time of day. Receive email/text message notifications, including optional video clip attachments, whenever new video is recorded. Plus, receive remote video storage all through Alarm.com’s cameras and online account, without the need of a security system. Image Capture on Alarm Capture motion activated images during system alarm events; up to 5 sets of images are automatically uploaded per event. Image Capture on Disarm Capture images during disarm events. Images can be uploaded to the image gallery. Daily Views Rules Create rules to upload and send motion activated images captured during a specific time period. On-Demand Peek-In Request system images on-demand to be uploaded immediately or upon next motion detection. Additional Image Upload Upload additional images that were captured by the sensors and not automatically uploaded, such as extra alarm, entry delay or disarm images. Image Alerts Receive email/text message image alerts on images captured during alarms, Daily Views, or Peek-In requests.